Antique Blue 2 seater Chesterfield sofa | Handmade by S.W. James & Co. Exclusive to the S.W. James website. Our No.1 2 seater Chesterfield sofa in blue is fast becoming a favourite of our customers. We think it is a truly stunning piece of furniture and it certainly makes a statement in any room it lives in. Our 2 seater No.1 antique blue Chesterfield sofa is still handmade by the team today, as it was originally. 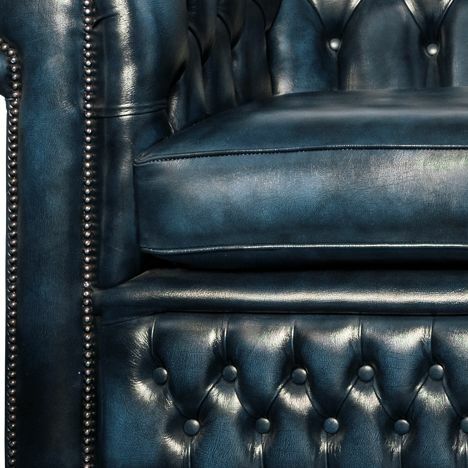 When covered in our blue antique rub leather each item we make takes on a character all of its own. Once finished a top coat of darker blue dye is carefully polished in selected areas to expose the lighter shade beneath. The result achieved is a beautifully aged looking, 2 seater blue antique Chesterfield. Our small sofa in 2 seater format provides ample seating space for 2 adults and sets the stage perfectly in any small room or snug. Available in a range of deep and moody stained antique leathers the No.1 has a timeless appearance that compliments a wealth of household styling. 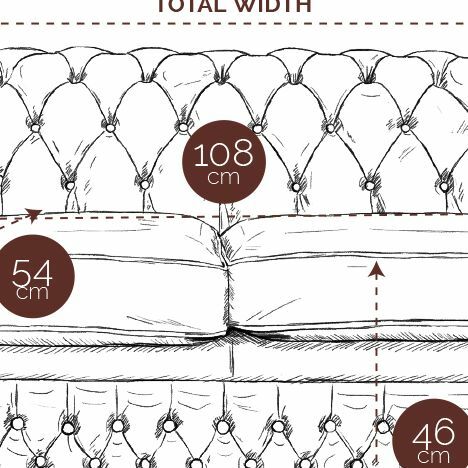 Standard seat depth and foam/Dacron cushions provide a firm but comforting sit.